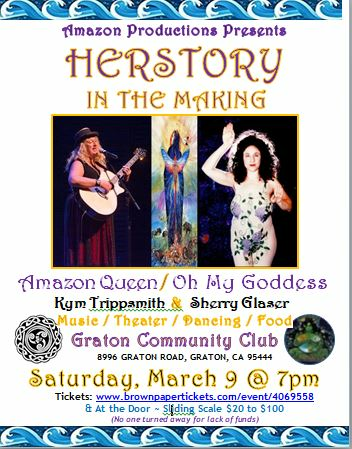 Under the new Umbrella of HERSTORY IN THE MAKING - AMAZON PRODUCTIONS celebrates International Women's Weekend at the Graton Community Club with two beloved Artists on Saturday March 9th @ 7PM. OH MY GODDESS! 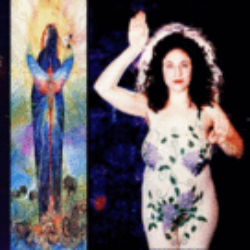 is a one woman show that brings to life Mother Earth Herself through the wit and wisdom of award winning actress SHERRY GLASER. While the world brews with more chaos and violence everyday, The benevolent Mother is always there to comfort, guide and make us something delish to eat! She is brought to us by Sherry's characer - Miguel D' Cervantes, an irreverent everyman who has his sights on the 2020 election - With Ma as his "AdVice President" He can't lose! Born in Scotland, KYM TRIPPSMITH writes stories, poetry and folk ballads laced with political satire, unvarnished truths, mystical clarity, family honesty and sly humor. Host of the Feisty Females Radio Show at KOWS.fm,Kym sings stories alive, weaving characters from the highways and byways of our joyous and sometimes weary world with haunting melodies, fearless lyrics and a rich creamy voice that takes listeners into the heart of her musical musings. Kym is a singer/songwriter extraordinaire with anthems, ballads and boogies guaranteed to set the tone for this evening of HERSTORY in the Making as we reweave and re-perceive the world through Her eyes for a change.